Dissolve gelatin in boiling water. 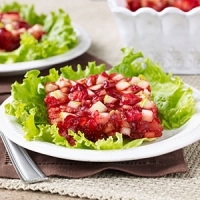 Stir in pineapple, cranberry sauce and wine. Chill until mixture thickens slightly. Fold in nuts and turn into a 2-quart serving bowl or 9 x 12 x 2-inch dish. Chill until firm. 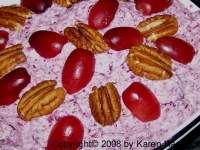 When gelatin is set, soften cream cheese and gradually beat in sour cream until mixture is smooth. 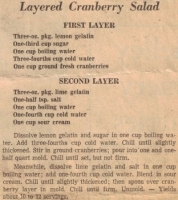 Spread over gelatin. Chill until serving time. Serve from dish. Makes 10 to 12 servings. Used a lot at Christmas and Thanksgiving, but good anytime.